Panzerfaust Replica German Rocket | BUDK.com - Knives & Swords At The Lowest Prices! 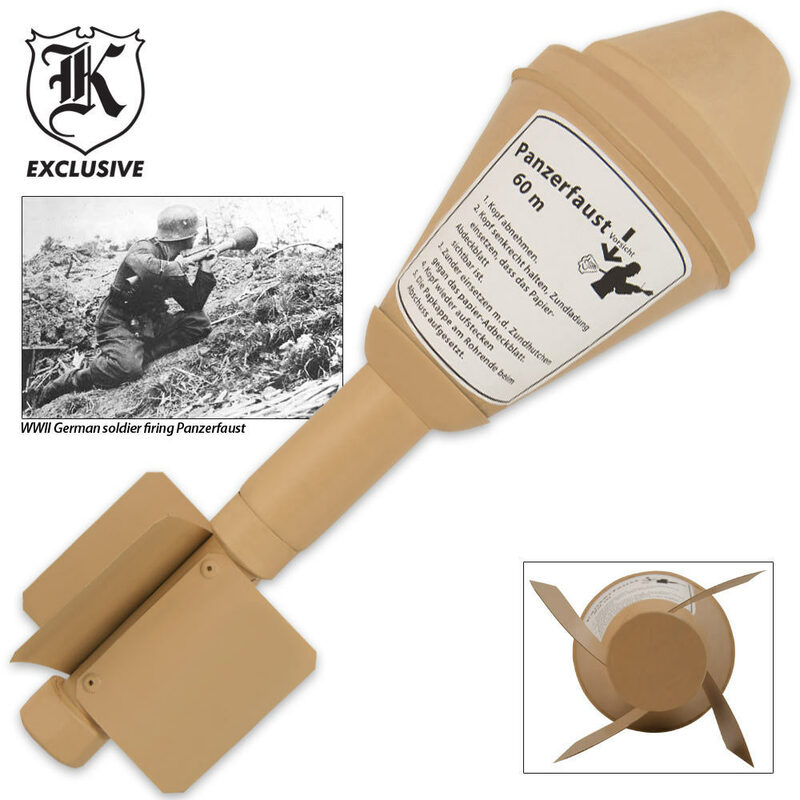 The Panzerfaust (German for "armor fist") was an inexpensive, recoilless German anti-tank weapon of World War II. The Panzerfaust remained in service in various versions until the end of World Wa II. This thing is way cool! It's also a LOT bigger than I thought it would be, which adds to the cool factor. It is about as realistic as possible at a give-away price. I have purchased so many military "things" from Kennesaw/BudK as I teach history at the high school level. Students love the hands on stuff I bring in. Kennesaw/BudK allows me to constantly have "show & tell" to keep my students interest high at prices I can afford. I love this company! I bought this for a high school buddy who retired from the Army after crewing M60's and M1's. Figured he'd get a kick out of it and he did. He didn't even have to Google it, already knew most of the characteristics. He enjoyed the gift and is happy with it. I was really impressed with this item i did't know if it was made of metal or plastic well it's metal,it's magnetic,and it's awsome so realistic would recommend to any military collector. Amazing , got for Christmas, just need to build a tube.